Regardless of the type of driving you do around Miami, the Chrysler Pacifica has unique external features that will make your trip easy and pleasant. The tri-plane panoramic sunroof gives everyone in the car an outstanding view of the outside. Everything is designed to be stylish so that you can take pride in your vehicle. Planet Dodge Chrysler Jeep RAM will be happy to show you the different options you have for the Chrysler Pacifica. 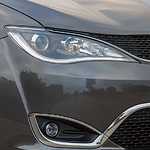 You can choose to have LED signature daytime running lamps or HID headlamps to ensure that you can see and be seen. There are also options to upgrade the 17-inch wheels to 20-inch ones so that you can turn heads when you drive. The Chrysler Pacifica isn't your standard minivan. It was designed to provide maximum impact protection and is made of dual-phase lightweight steel that will keep you and your passengers safe.